CHC Group has announced the launch of its new hoist training facility, certified to train offshore workers, SAR hoist operators and technical crew members in on and offshore hoist operations. 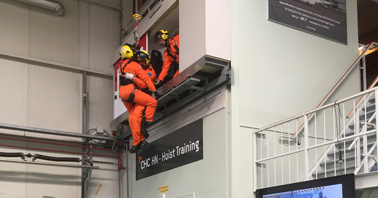 The facility, located within CHC’s Den Helder base, has been designed to resemble a Leonardo AW139 cabin and can also be used to simulate Helicopter Hoist Operations (HHO) conditions from an AW169. The one-day Helicopter Hoist Operations course, with an optional second day on the aircraft, is designed to offer theory and practice to between four to six candidates. Feedback from launch customers, including a major global oil and gas super operator major, has been very positive.